Chelsea Old Town Hall is located approximately mid-way along the fashionable Kings Road in Chelsea. The Main Hall (formerly the Vestry Hall) and the Small Hall (formerly the Green Room) are housed in the oldest part of the building dating back to the late Victorian era. These Halls can be found at the western end of the building. This Grade II listed building is an eclectic mix of social, artistic, retail and musical events, boasting elegance and sophistication when playing host to weddings, product sales and exhibitions, corporate events and private functions. Apart from the Hall galleries, all function rooms are fully accessible by guests with disabilities. This magnificent late Victorian building, lovingly restored to its original glory, provides a beautiful, memorable and photogenic backdrop for weddings and receptions, while its central position at the heart of the exclusive Royal Borough of Kensington and Chelsea, offers event organisers a well-placed, endlessly adaptable space. This unique venue brings heritage and style to every event. Step through the granite columned entrance to the Hall's marble-floored corridors and ornately coved ceilings and you are immediately somewhere special. One of London's most prized possessions, Chelsea Old Town Hall is also home to the iconic Chelsea Register Office where many glamorous people and famous faces have taken their wedding vows. 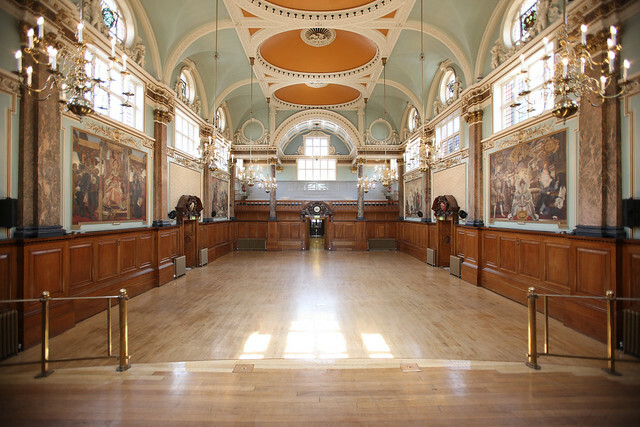 Above all, Chelsea Old Town Hall is an accessible, affordable, friendly and elegant setting for a diverse range of events. Antique and art fairs, VIP banquets, music concerts, designer sales, fashion shows, films, television and radio filming and recording, business exhibitions and conferences, corporate events and product launches have all been welcome by Chelsea.